Tamra and I took the bus into Seattle, getting off in the International District. The sketch on the left was done at 6th & Main of the now defunct Standard Cafe. A tour guide informed me that the neon rice bowl and sign were coming down soon (and that I might want to step back, there was a bus load of tourists about to walk around the corner). 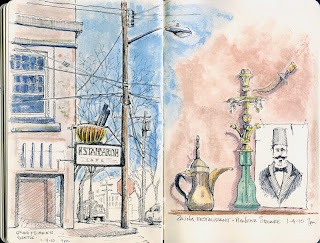 The sketch on the right was done after eating at Zaina, a middle eastern restaurant located at the north end of Pioneer Square. Great food and friendly staff. it is a great icon for the ID district. Really nice images! I wonder how soon the sign will come down, too bad!